For migrants and refugees in Italy, identity data collection processes can “exacerbate existing biases, discrimination, or power imbalances.” Digital Identity in the Migration & Refugee Context analyzes the challenges arising from this digital ecosystem and identifies three major areas of concern: bureaucratic bias in identity systems; privacy and mistrusted systems; and organizational data responsibility. The report is co-authored by Mark Latonero (Principal Investigator), Keith Hiatt, Antonella Napolitano, Giulia Clericetti, and Melanie Penagos. One key struggle is obtaining meaningful consent. Often, biometric data is collected as soon as migrants and refugees arrive in a new country, at a moment when they are vulnerable and overwhelmed. Language barriers exacerbate the issue, making it difficult to provide adequate context around rights to privacy. Identity data is collected inconsistently by different organizations, all of whose data protection and privacy practices vary widely. "The systems that use identity data to classify individuals along political and economic lines can have lasting effects on their rights and freedoms." 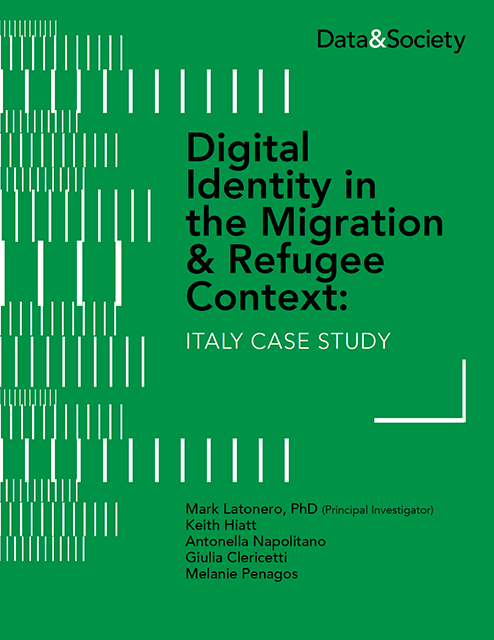 While Digital Identity is grounded in the Italian context, it has implications for refugees and migrants’ data privacy globally. The authors offer recommendations for stakeholders—including international organizations, policymakers, civil society, technologists, and funders—seeking to build stronger data protections. Report findings are based on interviews in Italy with refugees and migrants, local NGOs, government agencies, and international organizations. It was produced by Data & Society Research Institute, a New York City-based nonprofit focused on the societal implications of automated and data-centric technologies, and comes out of the long-standing Data & Society research project Human Rights, Data, and Migration. Previous reports from this project include Refugee Connectivity. Research in Italy was supported by Data & Society’s local partner, Coalizione Italiana Libertà e Diritti Civili (CILD), a coalition of civil liberty organizations throughout Italy. Stakeholders, particularly civil society, should be attuned to issues of migrant data collection and closely monitor any development of digital identity systems by government, international organizations, corporations, or NGOs. Civil society should advocate for the protection of fundamental rights and the creation of mechanisms for remedy and redress in digital identity systems. The NGO community should pursue more training for data protection and data responsibility practices. Foundations and funders should support data protection, data responsibility, and informed consent practices for their grantees. Funders should re-evaluate all requirements for organizations that collect, process, or share identity data on migrants and refugees. Donors should consider specifically funding the processes and tools of safe and dignified data collection. 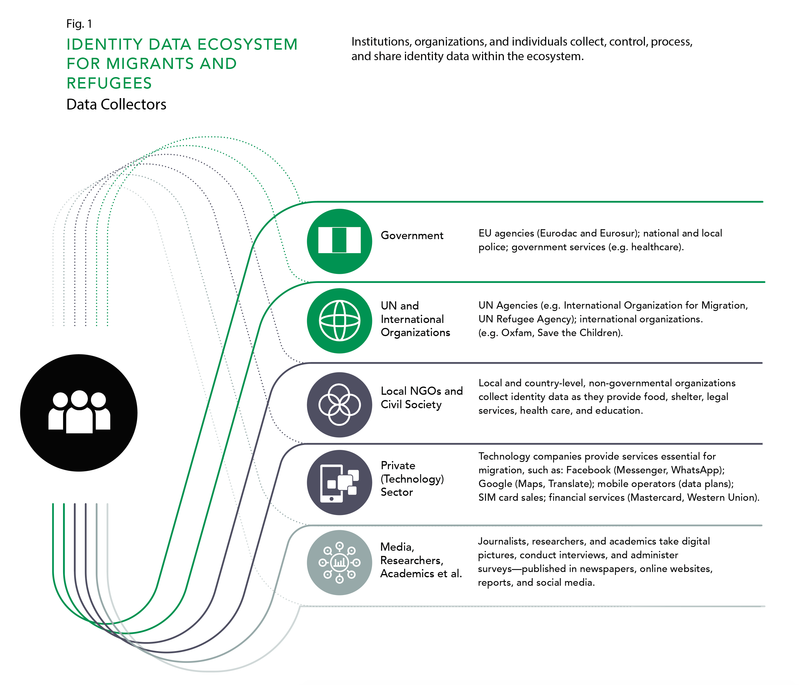 A technical audit of data security, as well as a human rights impact assessment, should be undertaken for organizations using any technology in the migration data ecosystem. Organizations employing cultural mediators should provide training on data protection, privacy, and informed consent. Guidelines for cultural mediators should be set at both international and national levels. More research is needed to build trust in the digital identity ecosystem, to develop opportunities for technologies to improve migrant and refugee inclusion, and to formulate effective policy responses. An Italian translation of this report is forthcoming and will be available here.